Back when we first arrived in Pinhão, one of the main attractions in the town itself is visiting one of the several Quintas that are located right in town. 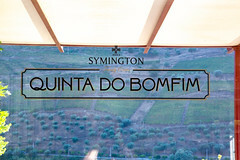 Quinta do Bomfim is run by the Symington Family Estates, who produce several of the well-regarded Port wine labels (Graham’s, Warre’s, and Dow’s), and over the last several years, they’ve converted the Quinta into a pleasant visitor center. It’s still a working winery (indeed, they were processing grapes on our visit), but it’s also got a nice museum and a great tasting room (note: reservations are strongly, strongly recommended). 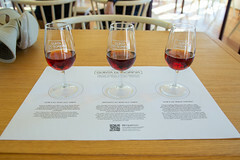 After a pleasant tour through the Quinta and a nice tasting session in the room (complete with 40 year old Port), we then realized we had made a tactical error: most of the rest of our tour then took prepared picnic baskets and headed off to the vineyards to have a picnic dinner. 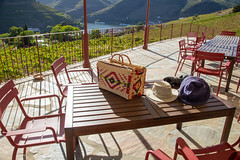 Lacking a reserved basket, we missed out, but when our itinerary brought us back through Pinhão, we decided that on our second pass we’d actually reserve a picnic basket and head up to the hills. You’ve got a choice of either sitting outside on their riverside terrace (just outside the tasting room), or walking up the hill through the vineyards to their Echo house, an event house with a large, expansive terrace overlooking both Pinhão and the Quinta’s terraces (and fresh, cold drinking water, since at least on our visit it was a hot and sunny 15 minute hike up there). For a two-person dinner, the basket is actually quite generously packed. The standard basket includes a fairly complete setup: bread, cheese, tossed salad, table grapes (one of the few times I saw table grapes instead of wine grapes), bolinhas do Alheira (sausage balls crusted with sesame), chicken pies, dessert muffins, water, and a chilled bottle of white wine, all packed up with glasses, utensils, plates, placements, and napkins. It’s a pretty substantial picnic basket, actually. 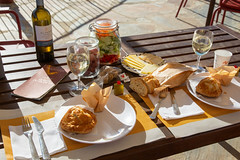 So, as we sat on the nice, airy terrace enjoying our wine as afternoon started turning into evening, it was quite a nice meal. Between two different cheeses, fresh bread, a light vinaigrette salad, and some grapes, there was a nice appetizer course. The chicken pie were quite a nice little package: nice, soft chicken in a light gravy enrobed in a nice, flakey crust, this went quite nicely with the rosé. Overall, this is one of those examples of a meal where the environment is easily the most important component, but Bomfim wasn’t slouching on either the food or the wine included with the picnic basket. If you’re looking for a lighter meal in an environment that’s hard to match, a picnic at Quinta do Bomfim is definitely a must.